Critics of Joyce have usually paid less attention to this play than to his other work. 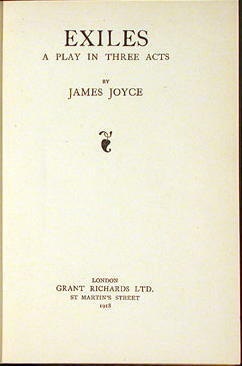 In the literary career of Joyce, it is both important and highly revealing. It casts light on Joyce's conception of escape, for it reveals something of what he meant when he had Stephen (in "Portrait of the Artist as a Young Man") speak of nets calculated to catch his soul. It also intimately reveals his relationship with Ibsen. It might be hoped that with this reprint edition of "Exiles" more critical attention may now be paid not only to this work of Joyce but to the works of Ibsen, which stand so clearly behind it. James Joyce wrote two prose plays: the first he dedicated to his own soul and then destroyed; the second receives attention perhaps only because of it's association with its more magnificent siblings. Even thought many people have recognized its brilliance, few have conceded that Exiles is a good play. Much of the criticism betrays the fact that it has been read primarily as a commentary upon Joyce's fiction-which is certainly a legitimate critical approach but does a disservice to Exiles unless the play is also evaluated on its own terms. The widely held assumption the Exiles is the aberration of a novelist, not the work of a playwright, is unlikely to yield a useful appraisal of the play's dramatic merits.